Virus TI OS4, Operating System from Access Music in the Virus TI series. 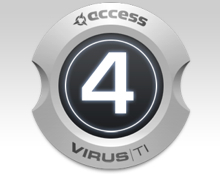 Access Music released a public beta version of OS 4.5 for the entire Virus TI series including the Virus TI Snow. TIOS 4.5 brings several new types of chorus effect to the Virus TI series, ranging from models of vintage chorus and tremolo effects, to the new Hyper Chorus. It also adds a rotary speaker simulation and several new mod matrix sources have been implemented. The Vintage Chorus is an emulation of the 70’s chorus technology based on a technique known as bucket brigades, which can be considered a predecessor of today’s digital sampling technology. The Vintage Chorus covers the sound of the famous Chorus Ensemble but also many other derivatives of that era which were based on the same basic circuitry, including the built-in chorus of the Juno 60. The Hyper Chorus is a six-voice chorus with up to three delay lines each for the left and right side. It is usually only necessary to adjust only the Depth parameter to achieve a huge and warm sound. The Air Chorus is a kind of chorus that doesn’t mix the direct sound to the processed signal. Instead, it modulates the pitch of the left and right side of the signal independently from each other. The resulting chorus sound happens in the air between both speakers, where both signals add together. The Rotary Speaker chorus type is a recreation of the sound made by the Leslie speaker. The Leslie speaker modulates the sound by rotating both the bass speaker drum and the tweeter horn inside a cabinet - but they are rotated at different speeds from each other. The result is an example of the Doppler effect. It’s basically like a vibrato, tremolo and chorus in one. Unstable tuning and inconsistent key-tracking are two typical symptoms of analog synths. In TIOS 4.5, Access Music have provided a way to introduce some of these quirks into the Virus TI, by way of the Analog Key modulation sources. The idea is to deliberately skew the key tracking in such a way as to create inconsistency across the keyboard, but in a repeatable way. A public beta version of OS4.5 is available for download. 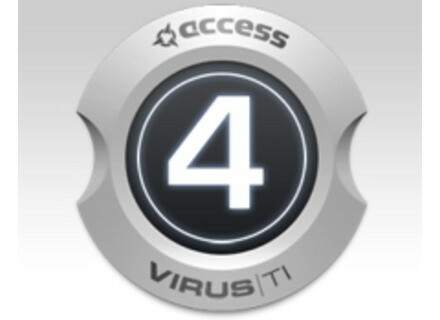 The download is free for existing Virus TI users. Tek'it Audio update Genobazz to 1.2.3 Tek'it Audio has updated Genobazz, its free bass synthesizer.